By this time we consider auto exposure and an electronically timed shutter to be absolutely normal, but in 1971 this was big news. 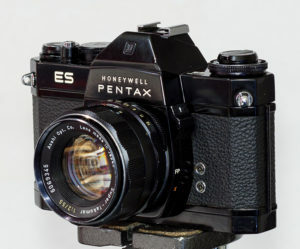 Throughout its life the ES electronics were subject to modification and improvement, leading some to call this model a prototype. Building on the success of the Spotmatic, the ES kept most of its virtues (solid construction etc) and added Aperture Priority auto exposure. 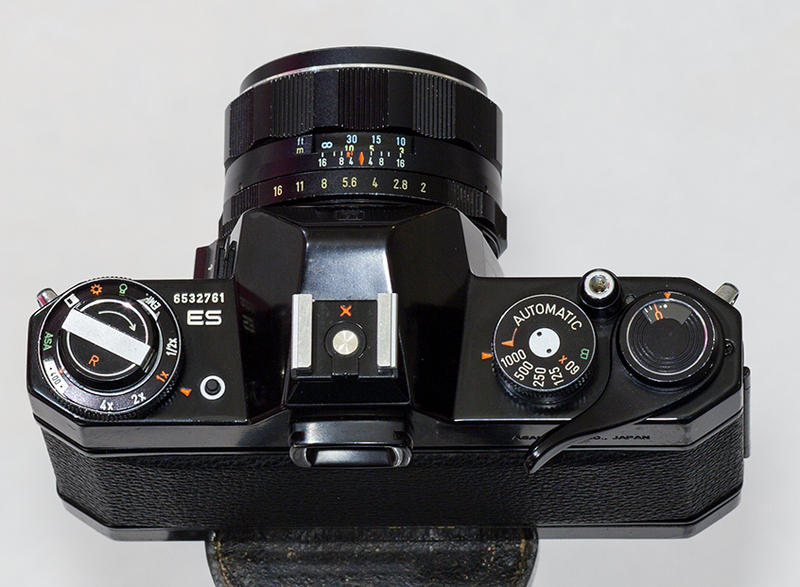 Prior to the ES Canon had offered the F-1 with shutter priority AE, in some ways easier to achieve because the mechanically timed shutter was a known quantity, and stopping down the lens a variable amount was relatively straightforward to achieve. Canon also felt that buyers would be more interested in shutter priority because it was more intuitive – set the shutter based on subject movement and let the aperture sort itself out. 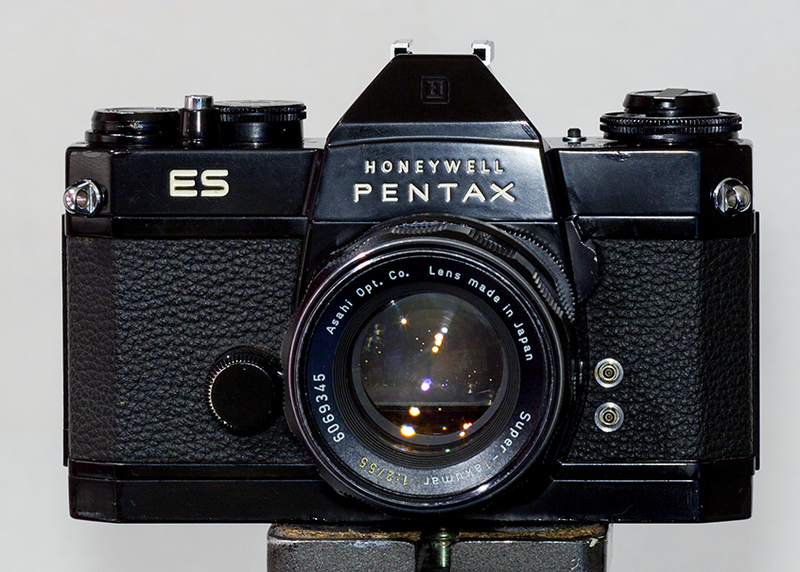 Pentax saw things differently, and reasoned that depth of field was a more creative control for photographers, but this would require an electronically timed shutter to achieve. As a result all existing M42 mount lenses could be used in AE mode, unlike Canon where AE had necessitated the switch from Fl to FD mounts. A single battery powers meter and shutter, which in AE mode offers continuously variable speeds from 8s to 1/1000th – leading in theory to extremely accurate exposures. 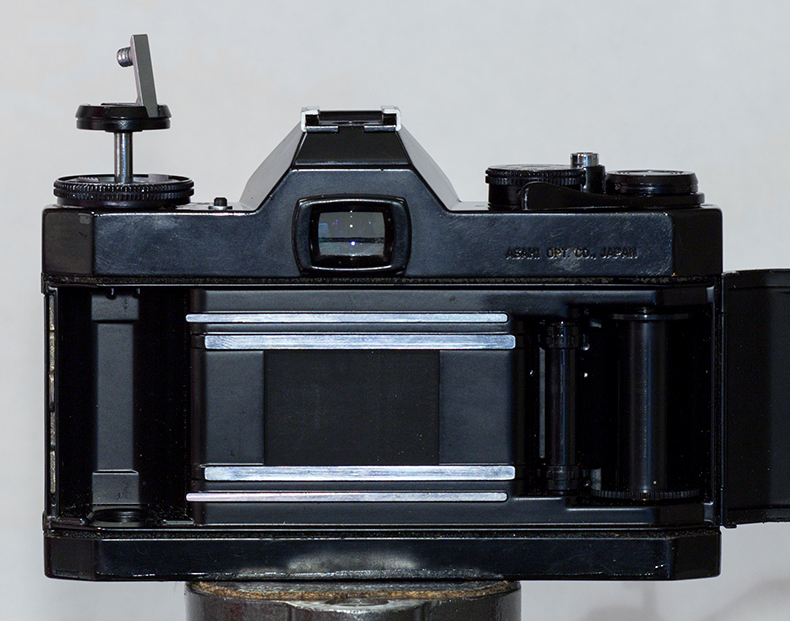 The shutter is horizontal and cloth, as they all were at that time, and as a consequence has the standard 1/60th flash sync. Exposure compensation is very conveniently set with the surround to the rewind knob, which lifts to set ISO. 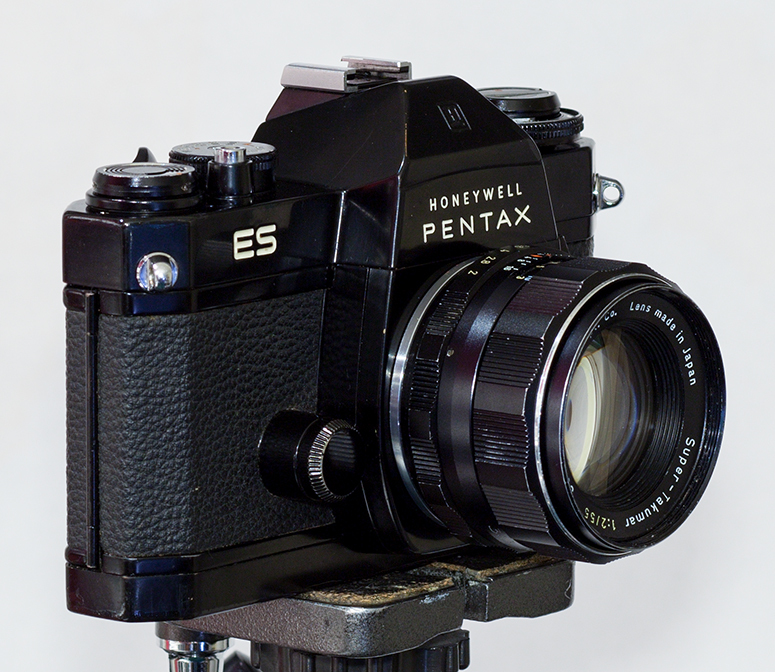 There’s no self timer or provision for a winder, though the shutter cocked red dot/window is a nice feature – to be seen on many, many Pentax models after the ES. Metering is TTL averaging, possible either fully open or stopped down, when in automatic mode the viewfinder needle indicates the chosen shutter speed. When in manual mode speeds are mechanical and at whole stops only from 1/60th to 1/1000th – oddly the longer exposures are available only when metering automatically. 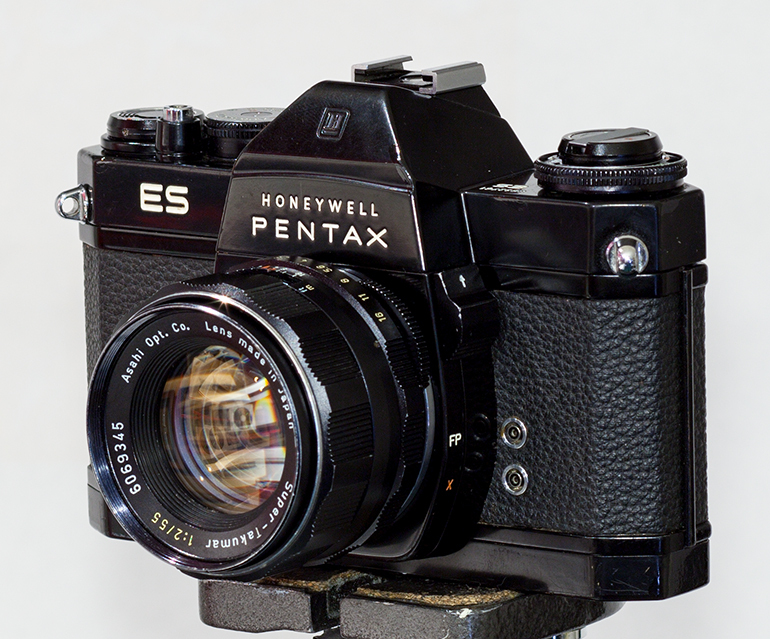 The worlds first ever electronically timed shutter, and first aperture priority automatic 35mm SLR. 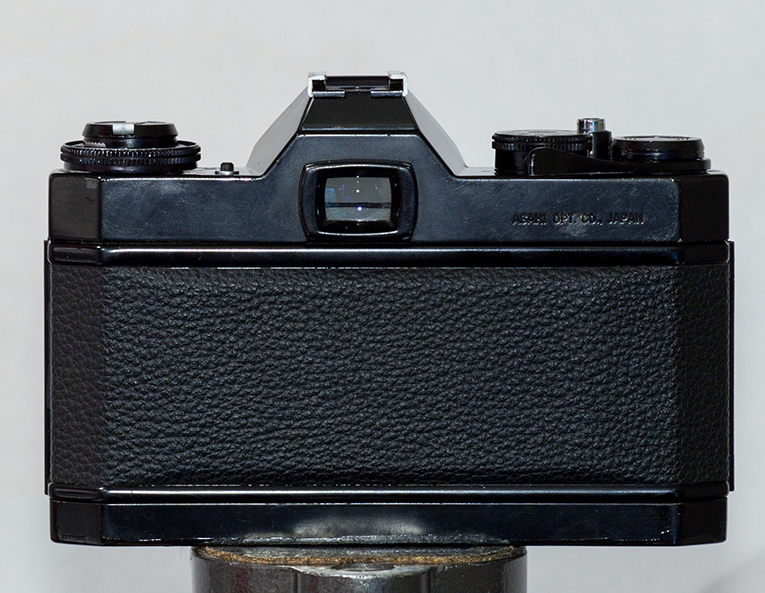 Generally in quite good condition except for what I think must be a crack in the pentaprism – there’s a line visible across the viewfinder and the mirror looks fine. Purchased through eBay December 2012 for $72, which seems like reasonable value, and it appears to work – auto shutter speeds “feel” about right.